Add some upscale appeal to your outdoor environment with the Open Air Lifestyles Commercial Cast Aluminum Dining Table selections. 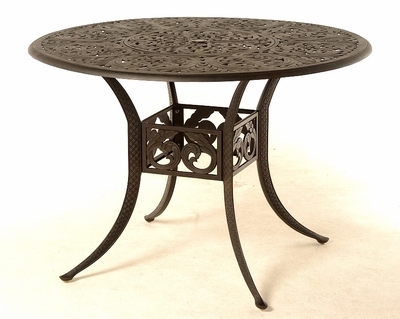 These designer tables are intricately crafted from highly durable and sturdy cast aluminum. Providing you with superior quality, these all weather tables are able to withstand even the harshest outdoor elements without the worry of rust or corrosion leaving you plenty of time to take care of your clientele. The powder coated finish ensures many years of outdoor use through each season at your hotel, restaurant or resort location. These tables are sure to make a luxurious addition to your commercial space impressing your guests with their beauty, style and functionality. Terms: All orders must be paid in full before final shipment is made. Large custom orders may be subject to different terms as well as 50% deposit to begin production. A purchase order is required with signature of approval to confirm specs and other details of purchase. Please contact us at 1-877-548-5697 for these details. Prices: All MSRP prices are as posted on our website. All orders will be quoted in writing to the customer before production with final costs and depend on final raw material spec and quantity that is required. Most custom furniture production will require a minimum order quantity. Freight: Our shipping costs for most items are based on each items size and weight. We strive to provide you with the most competitive shipping costs possible. All orders are shipped FOB Michigan or container destination. Unless a specific carrier is requested by the customer, all shipments will be routed at the discretion of Open Air Lifestyles. We may choose to deliver via container direct to certain areas based on the size of the order. Customer is responsible for ALL freight charges. Most new orders are shipped between 8-10 weeks. Freight Claims: Any damage to the shipment MUST be noted on the freight bill at the time of delivery. Save all shipping cartons. Claims for freight damages are the responsibility of the consignee and must be filled out with the freight company to collect damages. Be sure to take photos of cartons and provide specific details of damage on freight BOL. This is necessary for the protection of the buyer. Returns: We the factory must authorize all returns in advance, and return freight prepaid. Invoice must be attached. All orders are custom orders, therefore any cancellations after 24 hours of order placement will not be returnable unless approved by Open Air Lifestyles. Copyright © 2009-2018 Open Air Lifestyles, LLC ® All Rights Reserved.